Taking a break from the search for the Hobbies I visited my old site for Adders during the week and was not disappointed. 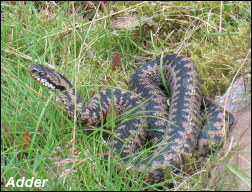 Six Adders were seen including four females together in some rushes alongside a drystone wall. I returned several times to film the interaction between these females and was surprised to find that the first female arrived on the mossy slope as early as 7.20am when there was still a heavy dew. It was most satisfying to sit within twelve feet of these venomous creatures and know that they had no idea I was there. Whilst watching the Adders five Crossbills and a Peregrine Falcon flew overhead. In the garden there are still many juvenile finches coming to feed and our garden record for Chaffinches increased to fourteen and a couple of days later rose to fifteen. It was only a few years ago that we hardly ever had a Chaffinch in our garden. Close by the garden is Norton Grange Hotel and on the 31st a Green Woodpecker called from their grounds – will one ever appear in our garden? By the M6 at Preston is the Lancashire Wildlife Trusts new reserve at Brockholes. I visited it during the week as a Hobby had been seen trying to catch Sand Martins in their artificial breeding bank. No Hobbies were present on my visit but I would recommend the centre to anyone. 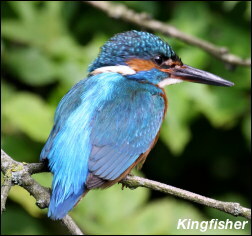 After predicting in last week’s blog that the Kingfishers would fledge their third brood of young on the 11th August guess what happens, it rains. Torrential rain overnight on Thursday resulted in a three foot rise in the water level of their stream and the drowning of their young that had just hatched. It was the last straw in a season that has had the worst weather in forty years including the most severe gale ever recorded in the breeding season in Scotland. Now that I am unable to film Kingfishers for the next three weeks I turn my attention to the thankless task of searching for Hobbies. A Sand Martin colony was watched closely but only a Sparrowhawk tried its luck, the Sand Martins being much too quick for it. A search on the moorland at an old breeding site once again produced nothing. Will I ever manage to film a Hobby? A field close to home, that had been sprayed with pig swill, produced more than sixty feeding Wood Pigeons. In the garden there has never been as many young birds as there are this year. It is especially pleasing to see a male Bullfinch feeding two juveniles. This April’s fantastic weather enable many species of birds to start breeding earlier than normal. 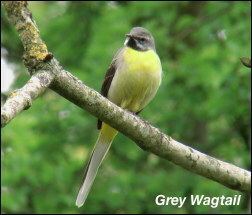 Grey Wagtails have all had second broods by now but this is the only year in the last forty when I have had Kingfishers in the course of rearing a third brood. At present their third clutch of eggs are due to hatch and subject to no major flooding their young should fledge on or about 11th August. It will be a remarkable achievement if they manage to pull it off. With last weeks good weather I spent a day around Morecambe Bay. Spotted Redshank and Greenshank were on the RSPB reserve but remained well out of reach of the camera. 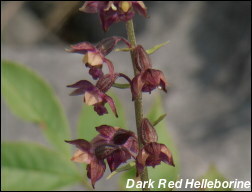 The limestone nature reserves held good numbers of butterflies and one of my favourite flowers, the Dark Red Helleborine. On another day I drove up to the Red Kite feeding station near Loch Ken in South West Scotland and along with many other people admired more than fifty Kites that were attracted to the free food put out for them at 2pm each day. For anyone who hasn’t been it is well worth a visit. At dusk on the 16th I was pleased to hear a reeling Grasshopper Warbler on Hopwood. It is some years since I have heard this elusive bird locally. The status of the Whinchat in the Pennines is very precarious and another year has gone without me encountering a breeding pair. 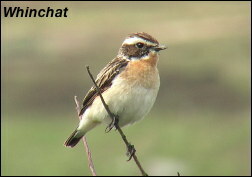 It is a bird that I look forward to seeing when I go to Islay where they are still relatively common. Why there has been a drastic decline in the Pennines is open to conjecture but over grazing and global warming must come into play. After forty years of filming birds I thought that I had encountered everything that could possibly go wrong in the pursuit of a photograph but events this week couldn’t possibly have been scripted. I had seen a Long Eared Owl out hunting over a moor between 8pm and 9pm and then feeding three fledged young in the forest nearby. To film this hunting male I would have to hide under my camouflage cloth and await his flight, which hopefully would take him past me. The only drawback was that in the forest there was a well used public footpath but perhaps the dog walkers would have gone home by that time of night? Filled with excitement of the challenge I arrived on night one in perfect conditions and by 8pm I was hidden away under my cloth waiting for him to commence hunting. However, at 8.10pm, a lady arrived with four dogs which she liberated to run amok along the forest path. Ten minutes later she walked back to her car with three dogs, one having gone missing. Over the next twenty minutes she shouted incessantly for the missing dog which finally returned to her. During this period the young Long Eared Owls stopped calling for food so there was no chance of the male hunting, as it is the calls of the young that trigger his hunting to fulfil their hunger. I went home dejected and no film! I was not going to be beaten so the following night I was back under the cloth waiting. Unfortunately so was the woman with the four dogs and yet again one dog failed to return with her so she spent another twenty minutes shouting its name which echoed through the forest. If that wasn’t enough the whole area was inundated with police as a body had been found in the reservoir. Failure again! Night three was perfect – sunshine, no midges and no people. The young owls started to call and the male was about to hunt when all of a sudden a van came over the moor and pulled off the road directly above where I was hidden. The passenger window was slightly open and the couple inside started to distribute the proceeds of the drug sales that they had achieved that night ! I prayed that they did not get out of the van otherwise there might have been another body in the reservoir, ie mine. Needless to say I failed to obtain any film and have given up on this family of Long Eared Owls. After filming on Islay for three weeks it was back to checking any nests that might be active in the Pennines. The Kingfishers that were on a second brood had fledged these also. Second choice was a pair of Kestrels that should still have had young in the nest in the wall of a ruined barn. As I approached the barn it was clear that all four young were on top of the barn and well able to fly! The third and last possibility were the Ring Ouzels who were just starting to build their second nest four weeks ago. This nest had progressed no further and the Ring Ouzels had moved on else where for their second brood, so it was back to nest finding! Two pairs of Little Owls were found with large young, one in a pipe nest site which was made especially for them in a new house and the other at the base of a dry stone wall. 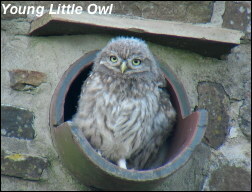 The pipe family were brilliant and the young provided some good video, with the male feeding three fledged young. The second site was a nightmare and I spent two hours in a hide looking at the top of a post waiting for the male to land with prey and of course he didn’t. As if I hadn’t already spent enough unproductive time on Islay looking at the top of posts waiting for birds to alight. Three nights have been spent on the moors waiting for a male Long Eared Owl to start hunting at dusk. On one night he performed well but the other two nights produced nothing but midge bites. This season has certainly been the most frustrating I can remember. The good news of the week was that whilst I was trying to relocate the Green Woodpeckers in a moorland Oak wood I flushed, from between my feet, a young Woodcock that was well able to fly. This was only fifty yards from the nest I filmed, with four young, in May. So at least one of those young has made it to the flying stage and perhaps all four have?